Located at 61° 12′W 13° 15′N in the southern portion of the Lesser Antilles, as a nation, St. Vincent & The Grenadines encompass the island of St. Vincent (133m² or 344 km²) and about two thirds of the cluster of small islands to the south (The Grenadines), covering a total area of 150m² or 389km². St. Vincent itself is volcanic, mountainous and barely inhabited in its interior, resulting in high density developments in more accessible areas. The island’s highest point is Soufriere, an impressive 3,864ft (1,178m). It is a volcano that has erupted as recently as 1902 and again in 1979. St. Vincent was originally called Youloumain, and also Hairouna – which is now the close name of its main brew! Fun things to do: diving, snorkelling, cruising, fishing, hiking, visiting places of historical interest as well as Pirates of the Caribbean film sites. Going to St Vincent & The Grenadines and wondering where to stay, what to do, where to eat and how to get around? We’ve got you covered with our list of hotels, restaurants, activities, car hire, shopping & more. Browse through for more details. This festival of boat races, sports and games, calypso competitions, street jump and beauty pageants is held in late May/early June. Bequia Carnival takes places at the end of June, and is a delightfully informal and spontaneous affair. First thought to have been inhabited by the Ciboney, an Amerindian, peace-loving, agricultural people. They were supplanted by the Arawaks, a more sophisticated group, traces of whom can still be seen in the petroglyphs at Layou and rock carvings near Akers. Eventually the war-like Caribs arrived and vigorously fought off any attempts at colonisation until 1719. In the meantime, in 1695 a Dutch slave ship was shipwrecked and a group of survivors climbed ashore in St. Vincent. In due course, they merged with the Caribs and a new race was formed, known as the Black Caribs. They, in turn, had children who became known as the Yellow Caribs and those later became known as the Garifuna (Cassava Eaters). The Black Caribs and the Yellow Caribs were intent on fighting with each other so eventually they decided in 1700 to occupy separate parts of the island to prevent further bloodshed. The Caribs allowed the French to create some settlements, the British were not so favoured. After complex struggles between all parties, Britain finally took control from both the Carib and French, the Treaty of Versailles was signed in 1783 and the 5,000 remaining Caribs were deported to an island off Honduras. Only a smattering of Caribs remain on St. Vincent in the Sandy Bay area. Like the French before them, the British also used African slaves to work plantations of sugar, coffee, indigo, tobacco, cotton and cocoa until full emancipation in 1838. The result was that the economy declined; Soufriere blowing its lid and covering much of the farmland with ash was the final blow. In 1925 a Legislative Council was inaugurated but it was not until 1951 that universal adult suffrage was introduced. Britain granted internal self-government to the island in 1969 and Vincentians became responsible for their own affairs. On Oct. 27, 1979 St. Vincent gained full independence within the Commonwealth from Britain. St. Vincent and the Grenadines are characterised by stability and are known for their genuine hospitality towards both their neighbours and visitors from the rest of the world. Agriculture is the mainstay of the population, with banana cultivation being the primary produce. The fertile soil, particularly in the Mesopotamia Valley, is known to the surrounding islands as the Vegetable Bowl! Since the filming of Pirates of the Caribbean, tourism is opening up. 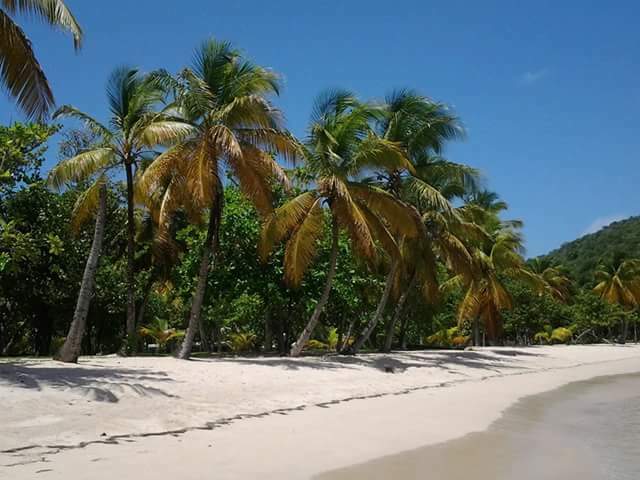 The Grenadines have always been a favourite of sailors because of the calm waters, fantastic snorkelling and diving, and the delight of wading ashore on an islet.